Mediocrity is a terrible standard to apply when hiring and retaining teachers. Plenty of research has proven the importance of effective teaching in promoting student emotional, social, and intellectual achievement. 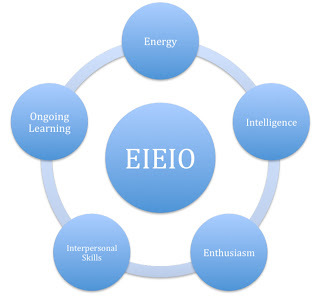 A friend for whom I worked talked about the "EIEIO Rule" when recruiting new faculty and considering renewals of veteran teachers' contracts. The graphic to the left defines each quality educational leaders should be looking for when building a dynamic and successful school.